This sled base stacking chair from OFM features a contoured triple curve padded seat upholstered in stain resistant fabric. 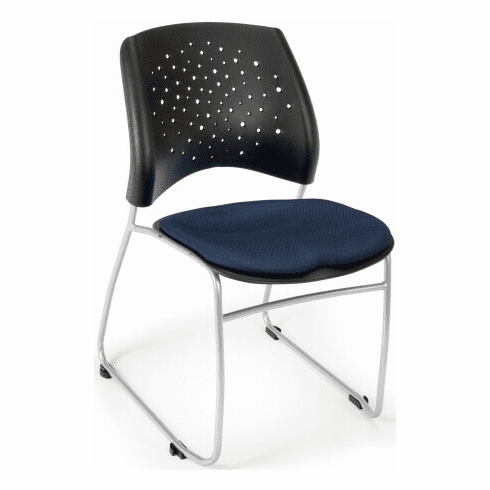 Other features include curved backrest with built in lumbar support and ventilation holes, removable seat cushion for cleaning or replacement, tubular steel frame design with silver powder coated finish and a sled base for easier mobility over carpet. Stackable up to (6) chairs high. Meets or exceeds ANSI/BIFMA standards. Dimensions: Seat Size: 18.5"W x 17.5"D. Back Size: 19"W x 16"H. Seat Height: 18.25"H. Overall: 32"H x 20.75"W x 23.5"D. Limited lifetime warranty from OFM. These stacking chairs normally ship in 1-2 business days from our NC warehouse.